Whether you are looking for a way to advertise your franchise or just want to make your car pop with chrome, our friendly staff of graphic designers and installers are ready to get started! With an array of different options and custom design work, we are sure to meet you specifications and give your vehicle the look you have been searching for. The high quality materials and installation processes we us mean your vehicle will remain protected and your wrap will require little maintenance for upkeep. We are proud to serve the Fort Worth, TX area and cannot wait to get started on your vehicle’s new look today! 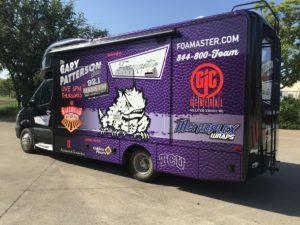 Contact Metroplex Wraps at 817-997-4431 for more information or to get started on your custom wrap.